Pioneers in the industry, we offer heat protective coats and high temperature suit from India. 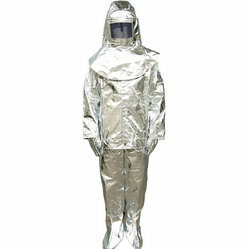 We manufacture and supply Heat Protective Coats using aluminized glass fiber fabric. The Heat Protective Coats is stitched with kevlar threads and related products. Long sleeve 35" heat protective to be used in Kiln & furnace etc. We are leading supplier of High-Temperature Suit. A hood with visor and inbuilt Firemen’s helmet as per IS 2745. A pair of boots with leather lining, anti-skid design Neoprene rubber sole, zip fastener. Size of boot 7 or 8, or 9 and height will be approximately 7". Made from fabric tested certified to EN 531 and CFEES (Centre for Fire Explosives Environment Safety) formerly known as DIFR (Defense Institute of Fire Research).